How do I set up my barcode fields in inFlow Cloud? Want to save time and avoid errors in your inventory? Setting up barcodes so you can scan your products may be the answer! By scanning products in orders and other workflows, inFlow can help you work faster while avoiding easy mistakes. To use the barcode scanner, you’ll have to add the barcode information to the corresponding products’ details, and we’ve made it quick and easy! This is best if your products don’t already have barcodes, or if you intend to print and apply price labels to your products. This method is best if your vendors ship you products with barcodes included and you’d like to avoid labeling your products when received. Go to the Main Menu > Options > Settings. Scroll down to the “Barcode Fields” section. 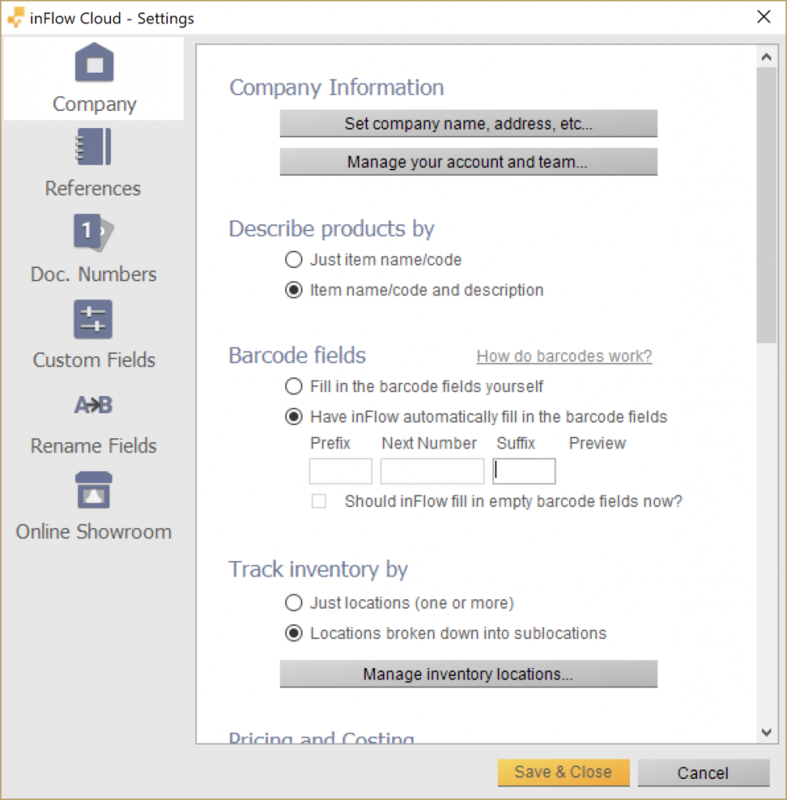 Select the “Have inFlow automatically fill in the barcode fields” option. Here you can choose to change the format of the barcodes that will be generated. Click Save and Close to start generating your barcodes. You may carry products that already have their own barcode numbers, or you may not want inFlow to create them for you. No problem! You can save existing barcodes into your product record too. Tip: You can store more than one barcode for the same product by separating the barcodes with commas. You can also import barcodes into inFlow instead of scanning them one by one. If you are importing your barcodes please note that inFlow is compatible with only 1D barcodes. Open the mobile app and head to the product list. Tap the search icon in the top right to search for your product, or select it from the list below. Scroll down to the barcode field and tap the barcode icon. If prompted, allow the app to access your camera. Align the barcode in front of the camera, inFlow will add it to the barcode field for you. Open the product record. (Main Menu > Inventory > Product List > double click on your product). Select the Extra Info tab at the bottom. Click into the barcode field at the top of the window. Now that it’s saved, it’s ready to be scanned into a sales order, purchase order, basically anywhere in inFlow where you can select an product! How do I use a barcode scanner with inFlow Cloud? How do I use wireless scanners with inFlow Cloud? How can I handle barcoding outside of inFlow Cloud?